This morning, DT's resident Buick lover, Hunsbloger, sent me a message. It was short. Something was wrong. Hunsbloger is never short. Hunsbloger is so wordy, he can't send text messages, let alone tweets. His family Christmas cards unroll onto the ground like Santa's list. I always wear adult diapers when we go to car shows together where there might be a Buick present because he is gonna rattle off worthless interesting facts until Pontiac is brought back from the dead. Not the brand, but the frozen head of Albert Hamilton Pontiac the 3rd is resuscitated by some unknown futuristic technology. Not today. Today the message was "Something wrong. No words." The DT brain trust initiated Emergency Protocol Number 7 and started scouring the internet for clues to Hunsbloger's sudden onset of mute-ism. And then it came. Words flowed like a dam had ruptured at the headwaters of the river Styx and we were powerless against the onslaught. Knowing there was only one way to fix our fallen comrade, I forwarded the link for this 1949 Buick Super Woody Wagon Could Be Redone As A Gorgeous 1949 Cadillac, Oldsmobile 98 or Buick Roadmaster currently bidding for $8,400 reserve-not-met with 5 days to go. And then the reply: "He has sucked all of the words out of the universe. I'm depleted, I need to rest, to store up. Its like a wizard who has performed too many spells in one day, and I need a booster." Hunsbloger was back, but will he ever be the same? 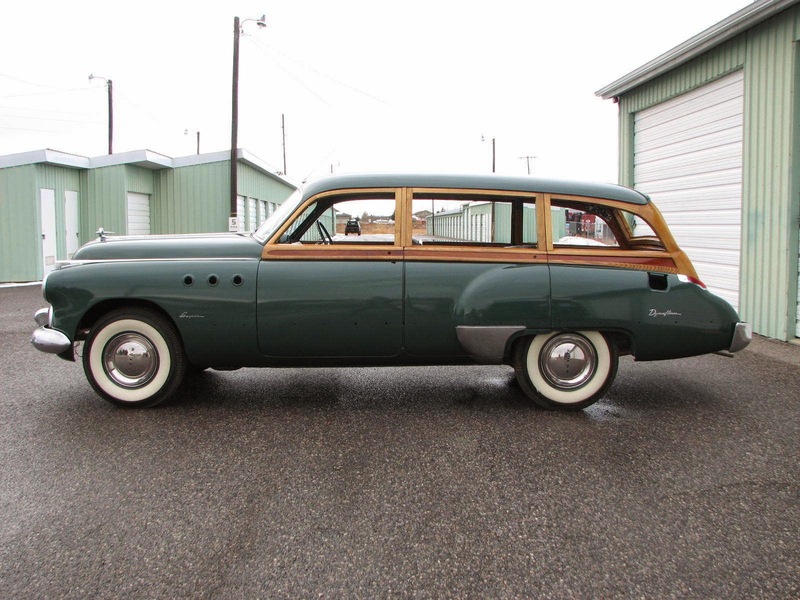 This listing is for a mostly restored 1949 Buick Super genuine wood bodied station wagon or "estate wagon" as Buick referred to it back in 1949. This car did not sell here several weeks ago so I decided to relist it a bit differently this time. I included the words Cadillac, Oldsmobile 98, Roadmaster and parts car in the title of this listing this time even though this car is neither a Cadillac. Oldsmobile 98 nor a Buick Roadmaster at all. If it is truly a parts car, then it probably is the nicest looking parts car you have ever seen. The first pair of photos show how the body from this 1949 Buick Super woody wagon could be used to build a 1949 and perhaps even 1950 Cadillac "Phantom" woody station wagon. The third and forth photos show how a 1949 or perhaps even 1950 Oldsmobile 98 "Phantom" woody wagon might look. These first four photos were made by a friend of mine using her Photshop.com program on her home computer. The next 20 photos show how the 1949 Buick Super woody wagon that I am selling here actually looks at the present time. General Motors never built any genuine wood station wagon bodies for use on either a Cadillac or Oldsmobile 98 in 1949 or 1950. General Motors did however use the same basic body shells on the Cadillac, Oldsmobile 98 and Buick Super and Roadmaster automobiles in those years. Therefore, it is possible to build a "Phantom" Cadillac or "Phantom" Oldsmobile 98 that never really existed using the body from this car on a 1949 or 1950 Cadillac or Oldsmobile chassis. It is also possible to use this very nicely partially restored wood station wagon body on a 1949 and perhaps even a 1950 Buick Roadmaster chassis if that hard to find car is the one of your dreams. I recently talked with a skilled craftsman in Washington who is building a 1949 Cadillac woody wagon this way. He is using a 1949 Buick wagon body like the body on the Buick I have listed here to build that car. He mounted that Buick woody wagon body on a Cadillac chassis with the entire dash, the hood, the grille and all 4 fenders, both bumpers and many other lesser parts from the Cadillac sedan. Since Cadillac shared the same basic sedan bodies in 1949 with the Oldsmobile 98 and the Buick Super and Roadmaster cars, it is not very difficult to convert a 1949 Buick Super station wagon to a 1949 Cadillac , Oldsmobile 98 or a Buick Roadmaster station wagon. Of course one would not have the original or correct body trim tag if they were to build such a conversion. He told me the two car's dash assemblies unbolted and bolted into the other bodies with no problems. He did have to cut the spot welds on the firewalls, remove them and re-weld them into their respective bodies. He mentioned that the Cadillac rear fenders bolt directly onto the back of the Buick station wagon body quarter panels. One would have to use the entire front clip as well as the front and rear bumpers from the Cadillac or Oldsmobile 98 as well. I think this car is way too nice to convert into a Cadillac or Oldsmobile 98 but I am mentioning that option here because I found that possibility to be fascinating. A beautifully restored 1949 Cadillac or Oldsmobile 98 woody wagon would certainly be a very desirable car and get a lot of attention at a show or in any collection. Now back to the "real world. I have this car listed here for two reasons. First of all, if it is sells that is fine and if it does not sell that is Ok too. This car is neither 100% complete yet nor totally restored yet and I am still looking for a nice un-broken front grille "eyebrow" or "mustache", some plywood door inner panels or patterns, quarter windows for the rear doors, a headliner, a complete set of carpets, a few lesser parts and some helpful information so I can keep working on this gorgeous automobile. Now for some history regarding this particular very fine 1949 Buick woody wagon. Please do not be frustrated because I listed this gem with a reserve. I do that so that I don't have to spend 10 days worrying about giving my car away or bother a friend to shill bid on it or buy it back for me at the end of the auction as some sellers do. This is not something a member of my family left to me that I have on here to get a cheap appraisal. I make most of my living buying and selling collectible cars, trucks, tractors, toys, signs and other items so this is here to find a new home. I listed a very solid 1967 Pontiac LeMans convertible that was missing an engine and transmission here on eBay about 5 years ago. I figured any A-body GM convertible of that vintage would not need a reserve. My car sold for $2,200 to a collector in New York who wanted the body to fix his rusty 1967 GTO convertible. He was absolutely elated to win that auction and told me that he placed a $7,600 proxy bid on my car in an attempt to make sure he would win it. It really hurt to find out that I left over $5,000 on the table on that deal so that is part of the reason I generally use a reserve on my vehicle listings here. If this vehicle does not meet my very realistic reserve and you are serious about owning it, please do not be afraid to contact me fwo we can work out a deal on it. I can make you a "Second Chance Offer" here through eBay so we can make it happen. The 1948 and earlier GM wood station wagons had bodies that were for the most part all wood with 4 wooden doors built on a steel floor pan. The Buick wood station wagons built between 1949 and 1953 were completely different than their 1948 and earlier predecessors. I believe that the 1949 through 1953 Buick wood wagon bodies were similar in many ways. They were pretty much 4 door sedans with a longer roof and had sedan steel front and rear doors except the rear door windows were square at the upper rear corner rather than being rounded. Wood was used to fill in the gaps between the tops of the rear fenders and the roof and to make the tail gate and upper lift gates. The station wagon also had a different rear floor with a spare tire and tool storage compartment located under the wood load floor that was level with the tail gate when the tail gate was in the lowered position. Divorce of a couple or death of an owner can be tough on a restoration project and unfortunately this car was subjected to both of those events sometime in it's relatively recent past. A friend here in Montana that brokers collector vehicles has an excellent website and received an inquiry from a young man in Arizona in the summer of 2009. He had inherited this car from the estate of his father and was looking for bumpers, grille parts and other chrome and stainless steel parts to complete it. It seems that his father was married to a woman and had that son long before he started restoring this car that I believe the son's grandfather had owned many years ago. The man restoring this car passed away and left this project to his young son about 6 years ago. That man was married at least twice as far as I can find out. When he passed away, this car was in a rental storage facility so the son was able to get possession of it. The current wife's garage held a lot of parts for this project including what I suspect included the re-chromed bumpers, grille pieces and other stainless steel trim pieces and even some exclusive station wagon parts. It seems that the widow did not give these parts to the son who inherited this car. Supposedly she offered the entire collection of 1949 Buick parts in her garage to a collector in California. I believe he had no interest in a 1949 Buick wagon so he bought most all of the non-woody wagon 1949 Buick parts. If you happen to know who the 1949 Buick collector is in California, I would like to see if he happens to have the rear bumper and other parts available for this wagon. A collector or parts dealer in Nebraska then bought everything that was left over from that widow. I later bough that group of parts to help complete this beautiful automobile. In the summer of 2009, which was sometime after the restorer's death and after the loose parts of this car were disposed of as described above, I bought this car sight unseen from the restorer's young son in Arizona. I was determined to finish this car so I routinely searched eBay for the missing parts. About 3 months later I found a listing for a set of 4 reproduced wooden door window outer trim assemblies. I contacted the seller who lived in California and specializes in re-wooding Buick woody station wagons. He had purchased a set of 4 patterns for these wood trim parts from the same man in Nebraska that had bought what was left of the collection of parts from the widow in Arizona mentioned above. He had the actual wood outer door window trim parts that came off of this car and used them as patterns to make the set of new wood window trim parts that this car has on it now. I paid him to pick this car up in Arizona and take it to his shop in California and start to work finishing the wood on this car. I don't have an unlimited budget for a project of this magnitude so work continued on and off as funds permitted for the next 4 years until the wood was all done and varnished this spring. The body shell was painted when I bought this car so I had a painter in California paint the 4 doors, 4 fenders, hood and some smaller parts a couple of years ago. That way the wood craftsman in California could install all of the parts he had been so patiently been working on through the years. I brought this gem home from California this summer and continued looking for the missing chrome, stainless steel and other parts. About two months ago my brother, who searches Craigslist diligently every day, found a very complete and straight 1949 Buick Super 4 door sedan in Ennis Montana which is only about 60 miles from where I live here in Bozeman Montana. I immediately dropped whatever I was doing and headed over there on a rainy day and bought that car for use as a parts car for this project. It was a very complete and relatively solid car with absolutely gorgeous chrome plated die-cast metal parts including both of the hood ornaments, the park lamp assemblies, the tail lamp assemblies, the Dynaflow emblems, the Super emblems and some lesser parts. The stainless steel spears on the tops of the front fenders, the hood center trim strip, the windshield center trim strip and some lesser parts were fine as were about half of the 10 stainless steel side molding trim pieces. The rear bumper was very nice with only some light surface rust on the sheet metal plate that goes behind the license plate. I really hated to knock such a nice 65 year old car in the head but that is the most economical way to complete this wagon so that is what I have been working on lately. I installed the stainless and chrome plated trim parts mentioned above and the good front bumper that came with this wagon to make this car as you see it here. I have a set of nice original "port holes" still on the parts car but I also have a set of new ones that I recently misplaced somewhere in my office so that is why they are not on this car yet. The gas filler door was missing when I bought this wagon so I took the door off of the parts car. It will need to be painted as will the nice pair of original GM fender skirts I recently bought here on eBay. Once that is done and about half of the stainless steel side trim is located and installed, this car will look even better than it does now. The 4 doors are hung and adjusted on this woody wagon but the door latches, window glasses, window regulators and inner door handle mechanisms are not on the wagon yet. I suspect the wagon used the same door latches and window regulators as the sedan and I have 4 window regulators that came with the wagon. I have none of the 4 door window glasses or the pair of rear window side glasses yet or patterns for them yet. I do not have either of the rear door quarter or vent windows either. I do have all of the new door side window channels that have not been installed yet. I have the gas filler door that goes on the left rear fender but it still needs to be painted. I also have the new rubber channel used to install the rear side widows as well as the pair of curved rear windows in the lift gate. I do have a nice pair of curved rear windows for that lift gate as well as the stainless steel vertical trim pieces that cover where the glasses come together in the center of the lift gate. I also have the re-plated center handle and both of the side rods and latches used to lock the lift gate. I also have a nice set of the side latches and cable retractors for the tail gate as well as an exceptionally nice original chrome plated die-cast center medallion with the cloisonné enamel Buick crest emblem. That medallion assembly goes in the lower middle part of the outside of the tail gate. I have none of the original or reproduction plywood door inner panels at this time and would like to find some or some patterns to make them. The fancy stamped steel caps that cover the tops of those plywood door inner panels were painted body color and nicely wrapped up when I bought this car and I have not unwrapped them yet. That group of steel caps also includes the pair of caps that cover the tops of the plywood rear inner side panels. I have lots of chrome plated exterior door handles but I am not yet sure if they are correct for this wagon or not. Any help on this question would be greatly appreciated. Fortunately, a huge photo album about 6 inches thick came with this car when I bought it. It has hundreds of photos taken of this car before the restoration was started and show the car to be the same color it is today. One photo shows what the young man I bought this car from believes is his father's father who he believes owned this car when it was new or shortly thereafter. Dozens of photos show work in progress on the body of this car. Several photos show this body on a rotisserie with a welder replacing a rectangular 2" by 8" piece of sheet metal on the rear of the driver's side rocker panel. Both the wood worker and the painter that worked on this car for me marveled at the quality of the work that had been done so far and could not believe that I had invested in such a project without first looking at it. I replied that I trust everyone at least once and if they are not honest with me, then I will be more careful if I deal with them again. I have not been disappointed with this project for the most part. It appears that the previous owner spared very little or no expense or effort in doing a quality restoration of this car. There are only two exceptions to that rule that I have found so far. The bottom of the storage well under the rear floor appears to have rusted out as they do on most of these wagons. It appears that someone used fiberglass to repair the bottom of that compartment rather than find a better replacement steel compartment floor. I suspect it would be next to impossible to find a better loose original steel storage compartment unless someone is reproducing them. Please let me know if you know of a nice original steel storage compartment that might be available or if anyone is reproducing that part in steel. It appears that the radiator had never been rebuilt so I sent it to a shop in Billings Montana that does excellent work on radiators. They called me and said that the core is beyond fixing so they are working on re-coring that original radiator for me now. The engine turned over fine when I picked up this car so when I got home with it, I drained the engine oil that looked like new, replaced the oil filter and added new engine oil. I removed the spark plugs and squirted oil in the cylinders and cranked the engine over with the starter a few times for a bout 15 seconds or so each time. I then hooked up a temporary gas tank, cranked the engine with the starter but it did not start. I found that there was no spark to number 1 spark plug so I removed the distributor cap. I found that someone had retrofitted a modern electronic ignition system. I had no replacement parts for that system so I installed the conventional ignition system parts from the distributor on the sedan parts car. The engine fired right up and ran fine with no abnormal noises and good oil pressure registering on the gauge. The radiator was still at the radiator shop so I used some pipe fittings to hood the radiator inlet and outlet hoses together and filled the engine with a solution of anti-freeze. I then ran the engine for about 10 minutes before it warmed up. I did this several times and could find no coolant leaks or other problems at all. I did find used pistons, used bearings, a used timing chain and some other used engine parts in one of the boxes of loose parts. That would indicate to me that perhaps this engine was indeed rebuilt fairly recently. I checked the level of the fluid in the Dynaflo automatic transmission and it was OK. I then started the engine and moved the gear selector to reverse and all of the forward gears and nothing happened. I plan to haul this car to a local transmission shop and have him check it out when he gets some free time. I am hoping that some relatively minor and easily repairable problem will be found when he removes the oil pan and that he can make this transmission work as it should. For now, you must assume that this transmission will need some professional attention to make it work properly again. The hydraulic brakes are not working so they may need to be bled or they may need some work on wheel cylinders or perhaps even a rebuild of the master cylinder. The steering appears to be nice and tight with no play to speak off. The muffler and entire exhaust system appears to be new. The 4 wide whitewall tires are new and the hub caps and trim rings appear to be new as well. The dash is absolutely gorgeous with a lot of effort appearing to have been spent on cleaning or rebuilding all of the gauges and the radio. It appears that all of the chrome plated die-cast control knobs and trim on the dash were either gorgeous originals or beautifully re-plated at some time. A new lined cardboard glove box was installed too. The golf ball sized round plastic knob used to rotate the radio antennae up when using the radio or down when the radio is off is in very nice original condition as is the original radio antennae. Both the front and rear seats have been redone in a very heavy and high quality darker green imitation leather material. The seams are very nice and straight as they were on the OEM upholstery. I have seen a lot of re-upholstered seats in my life so far and these have to be some of the finest I have seen yet. There is a rather heavy silver backed insulating material on the front transmission hump and on parts of the floors but there is no carpet in or included with this car yet. Four brand new reproduction stamped aluminum door sill plates are include but not installed yet even though they are shown in one of the photos of this listing. There is no headliner in or included with this car yet. The original 2" or so wide wood bows that hold the headliner in place are included and are in very nice original condition without having been refinished. Both the left and right grille halves and the very fragile chrome plated die-cast "eyebrow" or "mustache" that is above the grille were missing from this car when I bought it. I found a good pair of grilles here on eBay recently. The right half is superb with no cracks, breaks or repairs and has very nice original chrome plating with only very light pitting on the bottom inside where it is hard to see. The inner or left most tooth has a small ding that is only about 1/8" long. It is not very noticeable and would not be hard to build up if one decided to re-plate that grille. The left grille half is in similar condition but it has two cracks at the bottom that someone used JB Weld to try to repair. Those cracks broke while I was installing that half. I am sure those two cracks can be welded if that grille half is ever re-plated. I just bought a very nice undamaged left grille half with only some minor very light pitting here on eBay on November 27 and it will go with this project. The "eyebrow" or "mustache" shown on this car is from my parts car. It is in three pieces but has no pitting or other damage to speak of. I am certain that the right shop can repair this part before re-plating it but I am currently looking for a better one so please help me here too if you possibly can. I purchased new red plastic tail lamp lenses as well as the multi-colored plastic emblem in the chrome plated medallion frame that is on the front of the hood and they all look very nice. As I mentioned above, I found an exceptionally nice original rear medallion assembly here on eBay recently but I have not been installed yet. The chrome plated housing on that medallion assembly is about 12" wide and has a very nice original cloisonné enamel Buick crest emblem on it. The pair of red plastic lenses in that assembly are still very good but they say BUICK EIGHT rather than DYNA FLOW as they should so they really should be replaced eventually. Beautiful reproductions of this pair of lenses are available for $120 for the pair from Bob's Automobilia as are many other nice quality reproduction parts for this car. One of my next projects on this car will be finding the last 5 or 6 pieces of stainless steel door and fender side trim that are eight missing from or damaged on the parts car. I recently found an NOS stainless steel gravel shield for the left rear fender here on eBay and it is shown on this car. I removed the gravel shield from the right rear fender of the parts car and it is also shown on this car. A few days later I ran across another right rear fender gravel shield in a box of loose parts that came with this car. It looks to be in excellent used if not NOS condition but I have not installed it yet. I am in need of a source for the spring steel clips used to hold these rear fender gravel shields to the backs of the rear doors so please help me if you have them or know where to find them. Please help me regarding questions involving the rear bumper. That is the most baffling problem I have encountered on this project so far. The rear bumper shown on this wagon is from the sedan parts car. It appeared to be about 1-1/2" too narrow to fit around the rear of the wagon fenders. I installed spacers about 3/4 of an inch long between the front of the rear bumper mounting brackets and the back of the car frame to move the rear bumper back far enough so that it would wrap around the backs of the rear fenders. Either the wagon had a wider rear bumper or the rear fenders are now a bit wider than they originally were. Please let me know if this wagon originally had a rear bumper that was identical to or about 1-1/2" wider than the sedan rear bumper. One of the next projects I plan to tackle on this gem will be the 4 combination hood hinge & latch assemblies used to attach the hood. The hood is merely setting in place on the several rubber bumpers in these photos. I have almost three sets of hood hinge/latch assemblies and have picked out the best ones to bead blast before having them cadmium plated. It looks as if it will be no small job to install an align the hood on this car. Any advice regarding this task will be greatly appreciated. Both of the glass windshield halves shown in this car are not tinted or shaded and are in very nice condition. I have a very nice black steering wheel with a very nice horn ring assembly with no pitting of the chrome along with a nice plastic medallion in it from the parts car. I plan to install that steering wheel and horn ring assembly soon. The next to last photo of this listing show the several loose very nice original wood trim parts and headliner retaining strips that can be used to finish the interior of this car. The last photo of this listing shows a pickup tailgate loaded with parts unique to this station wagon that still need to be installed on this car. Many of those parts are used on the upper lift gate and the lower tail gate. I received what appeared to be a good Arizona title with this car when I bought it but the seller filled in my name as the buyer rather than leaving that title open as they could have and should have done. Therefore, I had to send it in here in Montana to get a new Montana title. I did that several days ago so I should have a clear and open Montana title for this car in about 2 weeks or so. DT E-i-C Vince: I'm not going to lie to you...I couldn't get though the entire thing. This is the challenge: Manually tweet (no autobots please) this entire listing on twitter under the hashtag #WindyBuick and you will win all the internets. Wow. I didn't make it all the way through, either. I think he could have finished restoring the car in the time it took to write (or read) that. Nice-looking car, though. ps: Word count on the text is 4893. I thought I owed it to the verbose among us to read it all...and could not. Perhaps there's hope for me yet. I envy those with an economy of words. I couldn't have even listed to this as a book on tape on a drive from San Diego to Fresno! I get the feeling that this guy will be relisting both. DT, somebody should try to get his story (Hunsbloger, perhaps?). I found this floating on the interwebz; "Bob (Woodburn) has a variety of cars ranging from a 1910 Kissel to 1960s Chrysler letter cars and Corvettes.". He also appears to be a rapid collector of signs and other automobilia - to the point where auction houses are having whole shindigs focused on this cars and accoutrements. This is a rich guy (alive, dead?) out in the middle of nowhere with a massive barn find tucked away on his property, the stuff collectors dream about. ..."on his cars and accoutrements. Answered my own question. Woodman is most likely still alive and this isn't his relatives selling off his prized possessions. Here's a photo of him (on the left) from 2012. Yes, yes, you AMC fanatics...that is a Javelin. I know, I know, settle down. You in the back there - stop doing that to yourself, you'll go blind. "The Phantom Woody"- That's my signature move. Its no wonder hunsblogger couldn't find the words to convey this cars ad.... The seller used all the words. I'm sure of it. In fact I think I'm out of words as well. This reminds me that a long while back I had to take my wife to see a "chick flick" movie as part of my regular smooze-her strategy to keep the car hobby moving forward. The move was "Julia & Julia". The first movie scene had a beautiful 1950 Buick Woody wagon in Paris. It was glorious. I thought...Hmmm, this move may be bearable if I focus on the scenery. Ohh my God it was painful to sit through the rest of that movie. That said, it gives the car a marketing angle at any car shows or if it is put up for sale if you stick with the Buick design. Go to this link HERE and scroll down the page to see the 1950 Buick Estate from the movie "Julia & Julia". I did not want to insert the picture as it is very large. In the spirit of verbosity, here's a pretty funny comment by someone from that thread. He's got more in common with the seller than he does with anyone round here. District 9 was one of the best slow burn movies ever. I was saying "what the heck is this" for like the first hour and then BAM it kicks into gear. The clicky shrimp things that turn out to be just the same as you and me. Then again, I'm a bit of a cooking geek and not embarassed to say I was OK with Julie & Julia. > Last night I went to the local Cinema Theater with friends to see a movie entitled "District 9". After only 10 minutes of viewing that film, my friends and I left this "science fiction film" to seek sanity a few doors down in the same theater. We found the movie Julie & Julia with the beautiful 50 Buick "woodie" wagon beginning the film. That beautiful "waterfall grille" on the car convinced me right off the bat that I was viewing the correct movie for me on this night. I wonder if the owner of the car is in the club. The owner certainly should be! Did anyone see the credits and was there anything there mentioning the Buick? In my opinion, Meryl Streep gave a performance portraying Julia Child worthy of an Oscar award. But the real star for me was that Buick! In the seller's defense, perhaps it is we of the internet culture who have the problem. There was nary a spelling or grammatical error in his whole piece. We are so used to reading any poster's idiotic posting in 140 characters (et tu, Brute?) that we have forgotten the .um..........art of speaking and writing in proper English. Though I have to say that the DT crew could certainly give almost any other car blog pointers on humor and word play. That said he could have bee a bit more pithy though he did attract our attention. Internet bonus points have been awarded to you for using the word "pithy". I have the address of some Sultan in one of my emails where they can be redeemed. He just needs your bank account number. If one is somewhat handy, they might be able to pick up the pieces and finish this project off and have a pretty nice classic...but that's a pretty big IF. It will be interesting to see what this one sells for...if it sells, that is. An interesting read and some very funny comments.